Agapanthus Atlantic Ocean and all other sizes and varieties of Agapanthus are available for special order. They are popular wedding flowers for use in bouquets and centerpieces – the tiny florets are often cut and used for corsages and boutonnieres as well. Agapanthus is generally seen as a garden flower and are good for use in vases due to their height. Also known as the Lily Of The Nile or African Lily, their blooms are plumes of small florets that sit on top of a sturdy stem. Varieties include shades of white, purple and lavender. All varieties generally come in with the bloom partially closed and are available sporadically throughout the year. It is recommended processing them 2 to 3 days before use in order to allow the bloom to hydrate and open. Average vase life of Agapanthus are around 5-7 days. 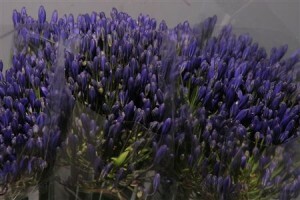 We import Agapanthus from Holland and when in season, we buy from local farms in the United States. 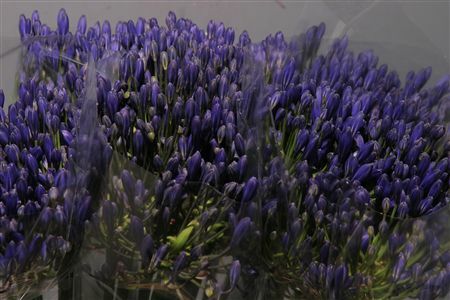 Wholesale Agapanthus are sold in bunches of 10 stems. Agapanthus should be kept in a cool area for storage, or left at room temperature to allow to hydrate before use. We can accommodate special orders of bulk quantity of a specific color, please give us 10 days notice – often we can accommodate last minute orders as we keep many varieties in stock. This Item Is Available Through Our CITYSIDE HOLLAND DIRECT Program, Please Click Here For Availability and Pricing…. We specialize in special orders of all wholesale flowers for weddings, special events, School and Church sales.